The head of 38 Studios talks Amalur with Conan O'Brien, then launches him into a wall with a mace. Curt Schilling is in the news a lot these days for his well-received Kingdoms of Amalur: Reckoning, so it's easy to forget that he initially made his bones as a ballplayer, not a game developer. In fact, the former Boston Red Sox pitcher was one of the primary reasons why the New York Yankees lost the disastrous 2004 American League Championship Series. Even though he's regarded with something resembling war criminal status by New Yorkers, the man sure as heck knows how to play baseball, and had a chance to combine both of his passions on a recent episode of Conan, the popular talk show hosted by veteran funnyman Conan O'Brien. The two discussed the intersection of baseball and gaming, ending with a specially designed Amalur clip of a mace-wielding Schilling scoring a homerun with a gnomified O'Brien in place of a ball. Schilling, a lifelong gamer, credits his steady gaming habits with everything from keeping him in good spirits during baseball season to staying together with his wife of 20 years. "I think it's very close," said Schilling when asked whether he's spent more time in his life playing baseball or playing videogames. "I had the perfect gaming life. I made a stupid amount of money, and I worked once every five days." He even took his love of gaming overseas, visiting American troops stationed in Iraq to play Call of Duty with them. According to Schilling, the highly trained ten-man unit had no problem "waxing" a group of loudmouthed teenagers on Xbox Live. 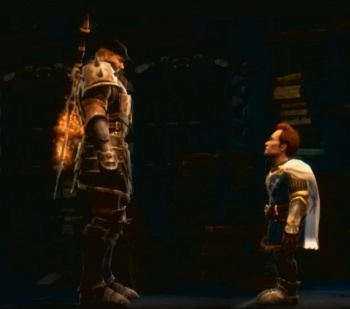 Now that Schilling's "stupid amount of money" has turned out a popular game, O'Brien was eager to see Amalur in action - especially when Schilling informed the talk show host that they were both in the upcoming clip. What followed was "a little localized version for the Irish-American gamers ... and the New England gamers out there," Schilling explained. In the clip, a Schilling-esque warrior clad in a baseball cap, armed with a mace (can we call it a "mace-ball bat?") tosses an unsuspecting Gnomon O'Brien into the air and dings him into a nearby wall. Leaving aside the facts that a "gnomon" is actually a part of a sundial, and that Schilling, a former pitcher, rarely had to step up to bat, there's still some fun to be had here. More importantly, the fact that a talk show host and a former ballplayer could spend a good four minutes discussing videogames speaks well of how pervasive gaming has become in modern Western culture. Now, is there anyone else out there who kind of wants to see these two characters show up in a future DLC package?